Our guide to the most intriguing movies coming to UK/ROI cinemas in March. On paper at least, March looks like one of the strongest months for movies in recent years, with such celebrated auteurs as Steven Spielberg, Lynne Ramsay, Woody Allen, Hirokazu Kore-eda, Wes Anderson and Steven Soderbergh dropping new films. It was a struggle to narrow down our picks to just 10, and along with the movies that made our list we're also excited for spy thriller Red Sparrow, Nicolas Cage horror movie Mom and Dad, Aussie western Sweet Country, Chinese animated gangster drama Have a Nice Day and blaxploitation throwback Proud Mary. Phew! 2018 will give us three films from Chilean filmmaker Sebastián Lelio. Later we'll receive his US remake of his 2013 breakout hit Gloria and the UK set drama Disobedience, but first up it's his Oscar nominated A Fantastic Woman. Daniela Vega is indeed fantastic as a trans woman who faces societal and bureaucratic prejudice following the death of her older lover. 2017 was the first year in some time that denied us a new Woody Allen movie in UK/ROI cinemas, but he's back with Wonder Wheel. Set around New York's Coney Island in the '50s, the film follows Kate Winslet as a married woman who falls for Justin Timberlake's lifeguard. Juno Temple and the resurgent Jim Belushi also star. After a tumultuous period in Hollywood that saw her leave western Jane Got a Gun halfway through shooting, director Lynne Ramsay is back in fine style with this gloriously cinematic adaptation of Jonathan Ames' novel. Joaquin Phoenix is mesmeric as a mercenary hired to retrieve a politician's kidnapped daughter only to find there's a wider conspiracy at play. Actor turned director Justin Chon delivers a fresh take on American race relations with this black and white filmed drama set in L.A's Korean community during the 1992 riots. Chon plays one of two brothers whose friendship with a young African-American girl is tested by the heated tension between the two communities. The phrase 'Christian cinema' may conjure up negative images of the sort of cynically produced cheapies that bother the US box office every now and then (God's Not Dead et al), but it's also given us worthwhile films like Noah, Risen and to a degree, the recent work of Terrence Malick. This take on the life of Mary Magdalene could follow suit, as it stars Rooney Mara and Joaquin Phoenix and is directed by Lion's Garth Davis. One of the most exciting filmmakers to emerge from Scandinavia in recent years is Sweden's Ruben Östlund (Play; Force Majeure). He returns with The Square, winner of top prize the Palme d'Or at last year's Cannes Film Festival. Set around a failing art space, Östlund's satire stars Elizabeth Oslen, Claes Bang and Dominic West. Arguably the most talented dramatist working in cinema today, Japan's Hirokazu Kore-eda continues his prolific form but steps out of his family drama comfort zone for a courtroom thriller this time. 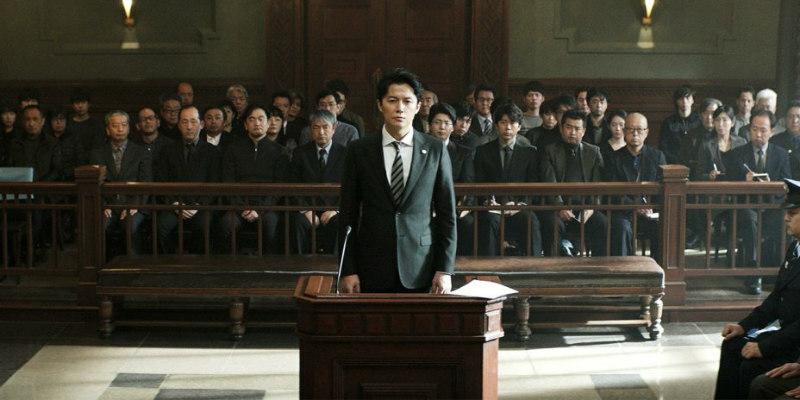 Masaharu Fukuyama plays a lawyer who sets out to prove his client didn't commit the murder he's accused of, despite the man pleading guilty himself. Having ended his predictably brief 'retirement' with Logan Lucky last year, Steven Soderbergh returns to his '90s indie roots with Unsane, a psychological thriller he shot in secret, substituting an iPhone for a camera. Claire Foy plays a woman who finds herself involuntarily confined to a mental institution and unable to leave due to her seemingly having committed herself. Steven Spielberg's The Post may still be playing in cinemas, but we're mere weeks away from his next offering. In the legendary director's adaptation of Ernest Cline's novel, Tye Sheridan plays a young man who lives in a dystopic future, finding a release by playing a complex virtual reality game based on 20th century pop culture. Will Spielberg comment on Hollywood's current obsession with nostalgia or merely add to its vacuousness? Fingers crossed for the former. Wes Anderson gathers a ridiculously impressive ensemble voice cast (including Jeff Goldblum, Tilda Swinton and Scarlett Johansson) for his return to the stop motion animation world he previously explored in 2009's Fantastic Mr. Fox. Isle of Dogs is set not in the London district, but on a Japanese island where dogs have been quarantined in a future dystopia.